Canadians familiar with the Christian relief agency Samaritan's Purse usually think of it working in international disaster response from Haiti to Bangladesh. But as Senior Operations Manager Joseph Park tells Convivium’s Hannah Marazzi, it also brings aid and comfort to locales across Canada, including the nation’s capital during a recent terrifying time of mighty winds. Convivium: For those of our readers that may be unfamiliar, can you summarize the events that unfolded in the Ottawa-Gatineau at the end of September? 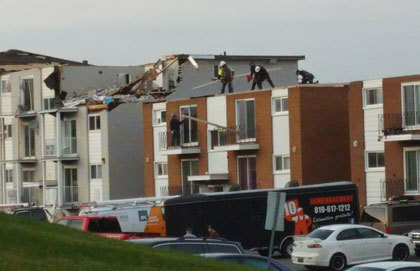 Joseph Park: There were six tornadoes that touched down in numerous locations across the Ottawa and Gatineau regions, which devastated parts of the city and outside of the city as well. Dunrobin, communities across the Gatineau, and a couple of locations in Quebec sustained the most damage. C: Tell us how Samaritan's Purse came to provide emergency aid for the Ottawa-Gatineau region? JP: Samaritan's Purse worked very closely with the city of Ottawa to assist all the private properties that had requested some assistance in the wake of the tornados. Because we are a donor funded organization, we were able to assist free of charge for the homeowners who were affected by the tornadoes. We worked with local volunteers in the Ottawa and Gatineau communities. We supplied all the tools, training and equipment and were able to help out the communities in that way. C: How does Samaritan's Purse determine where they send people? Do communities call you? Do you have some sort of an internal monitoring service that alerts you where and when to offer your services? JP: Samaritan’s Purse has two locations in North America. One location is in Boone, North Carolina and the other is located in Calgary, Alberta. Our offices work to monitor disasters, not only nationally but also internationally around the world, 24-7. Based on the severity of that disaster and the impact that it has on residential homes among other factors, we'll decide whether we're going to deploy or not. 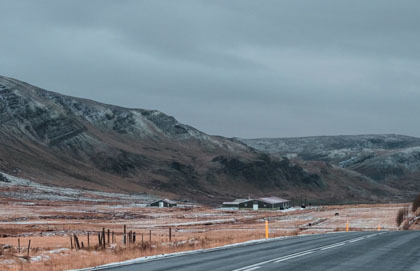 We usually end up sending an assessor in initially within 24 hours of a disaster - just to find out how bad it is and how big the need is and then we make a decision based off that exploratory visit. C: I first heard you were in the neighbourhood because a colleague told me he’d seen one of your specially equipped Disaster Relief Units on site at The Metropolitan Bible Church. What is a Disaster Relief Unit? I hope homeowners affected, in their greatest time of need, now realize that there are people there for them. JP: Disaster Relief Units are transport trucks that are fully equipped with all the tools necessary. Whether the disaster is a tornado, flood, or fire, the Disaster Relief Unit comes fully equipped with everything that we need to do any of that kind of relief work. C: How did you become involved in Samaritan's Purse? JP: I lived in Haiti for two years. I was teaching at a community college down there and Samaritan's Purse came in to assist after the earthquake. I got to know some of the staff. One thing led to another and I put a general application in to work with them because it was right up the alley of what I enjoyed doing. I joined the DART team with Samaritan's Purse five years ago. I've done 16 deployments with Samaritan's Purse. Everywhere from the Philippines to Iraq, Nepal Greece, and Bangladesh. C: Was this your first North American deployment? JP: No, I've done numerous North American relief deployments too. Essentially, the organization uses me because I live in southwestern Ontario. If I'm home between deployments, they'll call me up if something happens here in Canada – or even the United States – and ask if I want to help out. I've done about seven DART deployments in North America. C: Your sister ministry, the Billy Graham Evangelistic Association of Canada, was said to be deploying Rapid Response Chaplains on site. What do Rapid Response Chaplains do alongside you? JP: Rapid Response Chaplains are a ministry that looks out for the wellbeing of the individuals affected. It's one thing to go in and take care of the physical needs associated with a disaster, but there's also a lot of emotion that people are dealing with as well. So having the Rapid Response Chaplains there assisting us really helps the homeowners when they are dealing with their own internal trauma. C: What’s the history of Samaritan’s Purse in Canada? How has Samaritan’s Purse been a part of the Canadian story in recent years? JP: Samaritan's Purse Canada has deployed to numerous locations across the nation. We have something called the NAM team, which stands for North American Ministries. We were in Fort McMurray with the wildfires when a third of the city burned. We were up there doing ash sifting and possession recovery for homeowners who had lost pretty much everything. We've been out in Fredericton this year with the floods there, in British Columbia with the wildfires the last two years in a row, and in Nova Scotia with some floods. We were in Ottawa last year with the floods that happened as well. C: A few weeks out from the initial deployment, can you tell us about how your time within Ottawa communities unfolded? JP: As the Senior Operations Manager, I came in right away. Our team got here Sunday with the equipment. I was in Ottawa for three weeks. I remember the first time I went through Dunrobin. It hit me emotionally. I couldn't believe the devastation in that small community: how many houses were destroyed. The community was turned upside down essentially. We were also working in Arlington Woods - Craig Henry area – an older area of the city with many mature trees. I think of the homeowners who have to deal with the aftermath of it all – the community completely changing. C: Is there a particular story from your time here that you will carry with you after this? JP: There are so many but I think one that really impacted me is of an older couple – Chris and Rosemary – who lived out on the Fifth Line outside Dunrobin. I happened to be driving down the back roads one day and I caught site of Rosemary out of the corner of my eye. She was standing in her driveway holding a rake and just had a blank stare on her face. I went by and I just had a feeling that I needed to stop and go back and talk to her. When she realized what we did, she was completely astonished. She didn't expect that she was eligible for any kind of assistance because her house wasn't damaged, but there were so many trees down on her property. She was 73 years old and really not capable of cutting up trees with a chainsaw and chipping it and getting rid of all this debris. Yet there she was standing in her driveway, holding a rake wondering what to do. We were able to go in and help her. While we were there, she told me about a swing set that she and husband used to sit on every day. It was a swinging bench. It was destroyed by a tree falling on it. We were able to rebuild the swing set for her and her husband. When my team finished, they sent me a picture of her and her husband sitting on the swing. She had a smile ear to ear. It was rewarding. C: Do you have something that you would hope that these communities would carry with them after this time spent together with your team - something that they would remember about - what you guys hoped and prayed for that they would be left with after this experience? JP: I hope homeowners affected, in their greatest time of need, now realize that there are people there for them. These people are Christian people who love them and want to show the love of God to them. That’s what we're here for : not only to help them out physically in the work we do, but also spiritually and emotionally. I hope that not only Christians, but everybody, realizes the impact that an organization like ours can have. Hannah Marazzi is the Marketing Coordinator for Cardus. Joseph Park is Senior Operations Manager at Samaritan's Purse.